Finally, about a month and a half late, I have released Fish NDA, the stupidest program in computer history! Check out the details on my Apple II software page. This was my KansasFest 2009 HackFest entry; I intend to do some more work on it, but since the KansasFest committee already asked for an archive of it, here it is–I will warn you, however, that it is not even close to beta ready (even though it does work on my system). 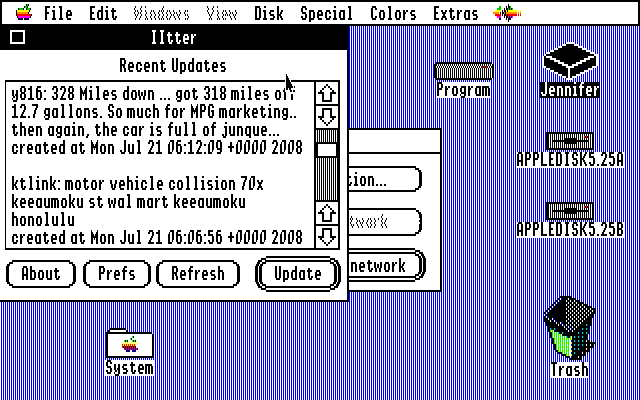 Today I will be releasing two new Apple II products: IItter 1.0 (only a year late), a freeware Apple IIgs Twitter client in a New Desk Accessory and Stock Quote CDA 1.0, a public domain Apple IIgs Classic Desk Accessory which gets stock quotes; the latter includes source and compilation instructions. Yes, I am here at KansasFest 2009; I will be releasing one program and at least announcing if not releasing another. Party on. When I first started figuring out how to do Toolbox programming (and trust me, I am a rank amateur), one of the things I remember Mike Westerfield (of Byte Works fame) saying is that to do Toolbox programming, you had to use records and pointers. Each card variable is a record, and that record has two of its own variables, s for the suit and v for the value. Presumably suit would be either spades, clubs, hearts, and diamonds, and value is between 1-13 (or, since not actually clear here, among 2-10 and Jack, Queen, King, and Ace). Let’s use another example: Twitter. My guess is that if you’re on the Internet (which you pretty much have to be to read this), you’ve heard about Twitter by now (or you just go to this site and nowhere else). In any case, I’m continuing to try and finish up my Twitter NDA, aka IItter, which is really close to release. In doing so, I learned quite a bit about data that Twitter puts out for each “Tweet” (each individual posting to Twitter). And yes, I know this is not 2007, but that’s what the Twitter API returned just now! Once I have those, I have the basis of the data I wish to display. I also know that the text of the Tweet is at most 140 characters; the created_at information is a fixed length of 30 characters (a lot like a standard Internet date and time string seen with, among other things, electronic mail); and we also know that the maximum length of a Twitter screen_name is 15 characters. We have declared a record type called twitter_record to suit our needs of grouping the text, screen_name, and created_at information together, then declared the variable my_twitter_record of the type twitter_record for our use in this program. So, there’s a quick bit on records. It’s going to take a bit more time to get IItter done (I was hoping while I was off but many other things also needed attending to). My KansasFest 2008 HackFest project, Bitly CDA, has just been released. 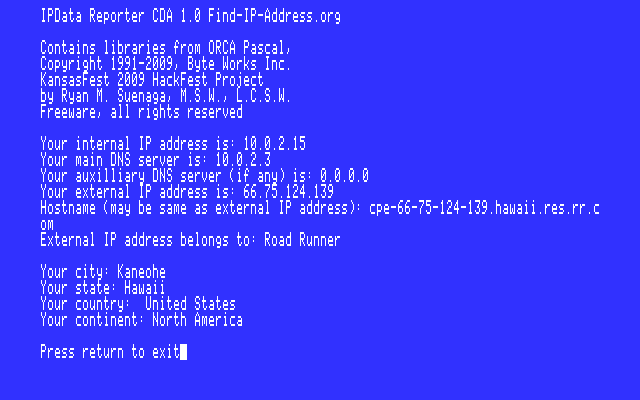 Requires System Software 6.0.1, Marinetti 2.0.1 or later, and a working TCP/IP connection. It uses the bit.ly Web site to shorten URLs. Check it out here! I announced (but have not yet released) a program at KansasFest, and I participated (for the first time) in HackFest (and won!) with another program that’s actually more ready for release. IItter is what’s not yet done, even though I worked on it forever (like more than a year). It’s a Twitter client in an Apple IIgs New Desk Accessory. Requires Marinetti 2.0.1, System Software 6.0.1, and a working TCP/IP connection. Bitly is a Classic Desk Accessory (that’s right, -not- a NDA, a CDA!) 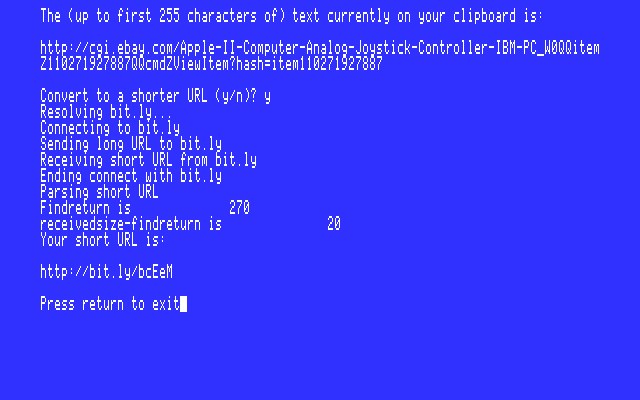 that takes the text content of the IIgs clipboard and submits it to the bit.ly URL shortening service, returning a shorter version. Screenshots (and hopefully a release! )d soon. and then encoded into Base64. As I’ve never tried to figure out how to encode into Base64 before, I decided this would be a nice exercise for my Pascal skills. Wikipedia to the rescue! Wikipedia provides about as close to a plain English step by step on encoding a string as Base64. This procedure, while it will run right now, isn’t useful without a bit more code that we won’t get into yet. Basically as the ploop starts with the first character in rawauthstring and moves character by character through the string until it reaches its end, it assigns the character at the current position in the loop to the character value parsedchar, then moves onto the next character. In order for this procedure to be more useful, more has to be done with parsedchar, starting with converting from a character to an ASCII value, then converting the numeric ASCII value into a binary value, padding the length of the binary value so it’s eight digits long, and adding it to a progressively growing string of 0s and 1s for further conversion. We’ll tackle some of this next episode! A2Unplugged.com got a facelift this past weekend, this site just got its own domain name (ryansapplesoftware.com), and I just launched my personal finance blog at Uncommon-Cents.net. Please check them out and I hope you like them. If you like my software, please consider donating with PayPal. © 2011, Ryan`s Software. All Rights Reserved.